Homes collect odors. They can't help it, because people cook and smoke and age and live with pets. A home owner gets used to the smells by living with them day in and day out. But when someone new walks in – like a prospective buyer – that person experiences all those smells full force. Now you can help your clients permanently get rid of those odors with PureAyre. No other product is as effective, as powerful or as natural as PureAyre. PureAyre works immediately to knock out odors by destroying the source of the odors. And, it's totally safe for homes, fabrics, furniture, pets and people. A bottle of PureAyre is also an easy and affordable way to show your clients that you're their partner in selling their home. Give a bottle to each new client when you advise them on preparing their house for market. They can both de-clutter and deodorize, and you've made selling their house that much easier. Homes aren't the only type of smelly real estate. Apartments are often smaller, confined spaces, where pet odors concentrate and cooking smells permeate the walls, carpets and curtains. Then you're stuck trying to rent to a new tenant and they're turning up their nose at the odors. PureAyre can rescue that rental. 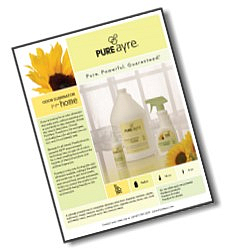 PureAyre can freshen up an apartment or rental, and deal with problem areas left by pets, beer spills or cooking odors. The result is a property that's more appealing and easier to rent out, without the expense of replacing or repainting.